It was an Autumn full moon night, Sharad Purnima. The warmth of the air mingled with the cool night, just right. Late into the night the moon shone, in the silence the ripples of the river Yamuna, moonlight shimmering. The toads croaked and crickets chirped. 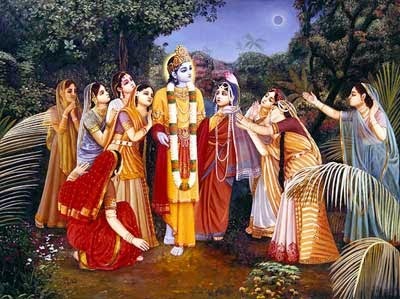 Then walked onto the green grass light blue feet, with anklets, and the most graceful gait, there He was - Sri Krishn! With large, deep, seductive eyes, that take you into trance, and a half smile, His face of transcendental peace. Then he lifts the flute to his lips and crosses his right leg over the left. As He started filling Prana into the flute, everything became alive. The notes flowed out of his flute, and nature felt silent to listen, the toads and crickets became quiet. A gentle wind came to greet Him, carrying the scent of the Kambha flowers, filling the garden of love with divine incense. The flowers seem to open as though in bliss, and branches dance to the rhythm of Murari’s flute. As the notes of his flute carried to the Gopis’ ears, they sensed the divine melody and as though in rapture, froze where they were. Following the flow of the music, they were drawn to Him, leaving their homes and fastened to the source. In the Kadamba garden of Nidhi kunj He was waiting for them, gleaming in the moonlight, in the dark night His blue skin, sparkling ornaments, and bright yellow silk dhoti. Seeing Him such, and that intoxicating flute, their minds where entranced, a most beautiful moment. The grove looked decorated with flowers and filled with sweet scent. He looked at them, smiled and then led them into a dance, the Raas Lila, the divine dance of duality, of consciousness with creation!